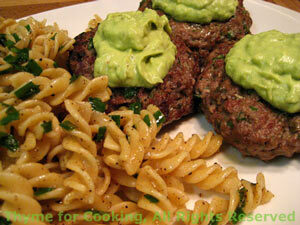 Burgers with Tarragon, Capers, Avocado Sauce, Thyme for Cooking. Tarragon, parsley and capers give a 'French' flare to these burgers. The Avocado Sauce is a nice switch from ketchup, or other 'red' sauce and works perfectly with the tart capers. The Avocado Sauce is also great as a pasta sauce. Chop capers if large, otherwise leave whole. In medium bowl mix herbs, breadcrumbs, capers and wine. Add beef and mix well - hands work best. Sauté in a nonstick skillet for 4 - 6 minutes a side, depending on how you like them done. OR cook on barbecue grill for the same amount of time - until done to your liking. Use a grill basket or pan. 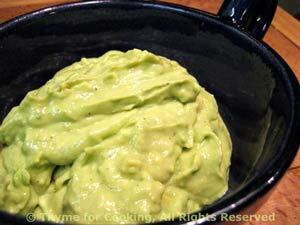 Remove avocado from shell and put into a medium bowl. Add lemon juice and mash with a fork. Then take a whisk and whisk until fluffy. Whisk in yogurt and tarragon.